Take the cocktail lovers' tour of lower Manhattan with recommendations from bartenders for where they drink and shop for tools and spirits. New York City is one of the premier cocktail destinations in the country and while there is a range of places to drink and shop uptown, in Brooklyn, and in Queens, this bartender-driven guide explores the section of town below 23rd Street for all things cocktail-related. Find out where to buy spirits, bar tools, and ingredients; and where to drink midday cocktails all the way through late-night boozing. Hidden away on the fifth floor is one of the top places to find the best barware items in the country. Selling everything from Japanese mixing glasses to artisan bitters, unique syrups and rare cocktail books. Make sure to check out their full library of cocktail recipe books, including first-edition Jerry Thomas. Located on the second floor, Diane Petipas has been collecting 20th century design for thirty years. Bartenders love this specialty foods shop for their selection of unique products. Numero uno when it comes to selling spirits. Chances are good that the guy at the next bar stool is a chef or bartender off the clock sipping a cocktail and eating a burger. Tucked in the back of the NoMad Hotel, head to the Library Room for some of the best cocktails in the city. Spanish for “Love and Bitters” this tiny bar’s cocktail menu is centered around bitters and gentiane aperitifs and is an industry favorite. Bartender Xavier Herit at The Wallflower | Photo Credit: Find. Eat. Drink. Barman and co-owner Xavier Herit made a name for himself in the hospitality world as the head bartender at Daniel for seven years. The front room is an intimate cocktail lounge. For the restaurant, you’ll find a French-inspired menu with raw-bar selections, charcuterie, seafood and beef dishes. 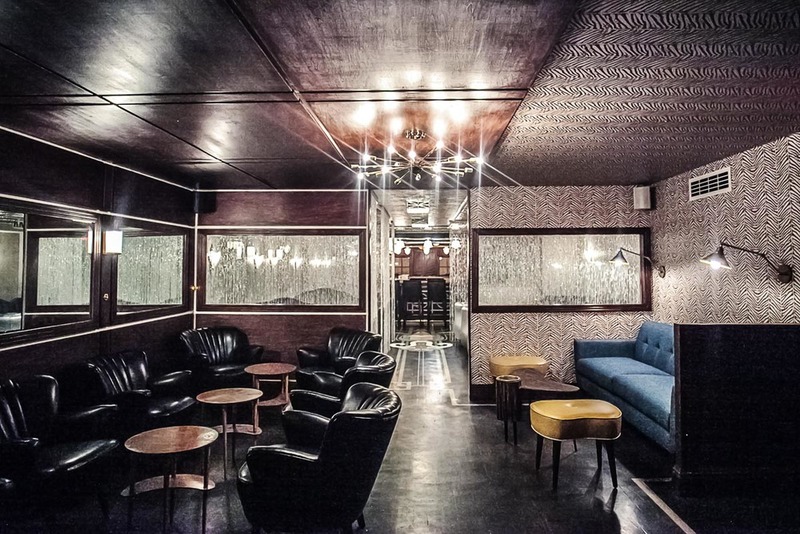 A cocktail parlor on Irving Place opened by bartender Meaghan Dorman and the team behind Raines Law Room. You’ll find former Beagle barman Tom Richter (Tomr’s Tonic) behind the stick making cocktails from a menu that features ten house and five classic cocktails. Check out drinks like the ‘Hero of Little Venice’ which is a grown-up version of a root beer float and the ‘Samoa’ that tastes like the Girl Scout cookie of the same name. The decor of each section of the room represents a different era. There is the 1950s & 1960s JFK room, the F. Scott Fitzgerald Art Deco period, the Abe Lincoln era and the Marie Antoinette room. Dave Arnold, the Director of Culinary Technology at the French Culinary Institute, is the mad scientist behind the inventive cocktails here. Opened in the former Milk & Honey space by alums Sam Ross and Michael McIroy. A subterranean cocktail den from Alex Day and David Kaplan, the owners at Death & Co. Look for Shapiro’s on Rivington and head downstairs. Holiday Cocktail Lounge has been a fixture in the East Village since 1919 when it was a speakeasy during Prohibition. Rescued and re-opened in 2015, it continues to be a combination dive bar cocktail lounge. On any given night, it could be shots, beer, cocktails, singing, loud music. Just what you'd expect from an old school East Village bar that Mick Jagger and other famous musicians would visit back in the day. A casual cocktail bar open late night with a full menu. You can get everything from salads to sliders to French onion soup to burgers until 4am. You'll see lots of industry folks here late at night. Death & Co’s David Kaplan and Alex Day joined forces with Cedd Moses and Eric Needleman for this subterranean cocktail bar. Garnet red hibiscus and island spiced liqueur that has origins in the Caribbean, but is made in Brooklyn. Recommended by bartender Sother Teague who pairs it with rum, or tequila and gin. Bartender Tom Richter is the creator of Tomr’s Handcrafted Tonic, an artisanal tonic syrup. This is a richer, spicier tonic syrup, intended for Gin and Tonics, but also as a potable bitter. You can find Tom Richter tending bar at Dear Irving. The PDT Cocktail Book is a complete bartender’s guide from Jim Meehan, the innovative mixmaster of the classic East Village bar called PDT (Please Don’t Tell). He has achieved star status in the cocktail world for his creative drinks and was named 2009 American Bartender of the Year at Tales of the Cocktail. Dave Arnold -- bartender and co-owner at Booker + Dax in New York. Naren Young -- bartender at Bacchanal and formerly Saxon + Parole, The Daily, and Public in New York. Eamon Rockey -- beverage and general manager of Betony in New York. Theo Lieberman -- bartender formerly of Lantern's Keep and Milk & Honey in New York. Tom Richter -- bratender at Dear Irving in New York. Xavier Herit -- bartender and co-owner of The Wallflower in New York. Alex Day -- bartender and co-owner of Death & Co. in New York. Sother Teague -- bartender at Amor y Amargo in New York. Nick Bennett -- former head bartender at Booker & Dax now at Porchlight Bar in New York. Meaghan Dorman -- bartender and co-owner of Raines Law Room and Dear Irving in New York. Dan Greenbaum -- bartender at Attaboy in New York. Mayur Subbarao -- bartender & spirits producer at Bittermens Spirits and Vendetta Spirits in New York. Romée de Goriainoff -- bartender / owner of Experimental Cocktail Club in New York and Paris. Tony Conigliaro -- bartender and co-owner of 69 Colebrook Row, The Zetter Townhouse, Grain Store in London. Simone Caporale -- bartender at Artesian Bar in London. Erick Castro -- bartender at Polite Provisions in San Diego. Gabe Thompson -- chef and co-owner of dell'anima, L'Artusi, and L'Apicio in New York. John Fraser -- chef and co-owner of Dovetail and Narcissa in New York. Matt Lambert -- chef and co-owner of The Musket Room in New York.